In my previous blog article I gave an introduction into EQUEL, an Elasticsearch query language that exposes ES functionality beyond the capabilities offered by Kibana and many other tools. 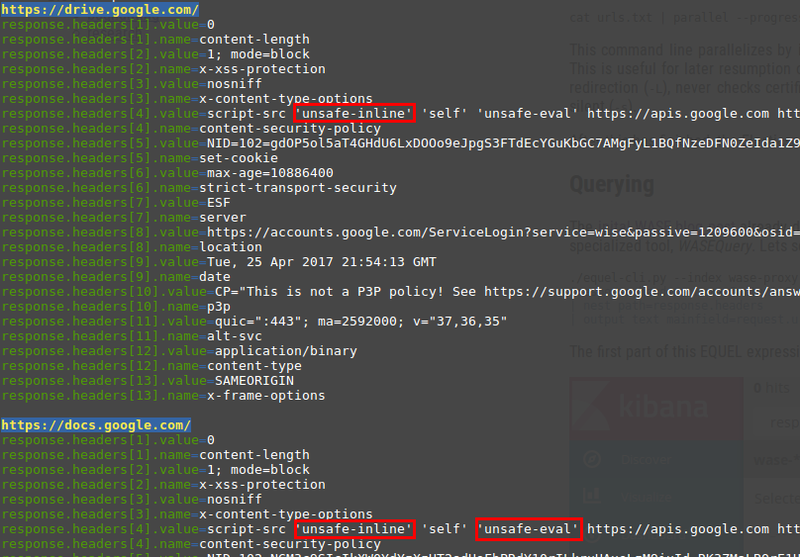 This article describes the usage of EQUEL in combination with WASE, the Web Audit Search Engine, a tool that feeds an Elasticsearch instance with HTTP request/response data from the Burp Suite or from the included proxy server. WASE uses nested documents to for storage of HTTP parameter values, header data and cookies. Unfortunately, nested documents are not well supported by Kibana and Elasticsearch query strings. 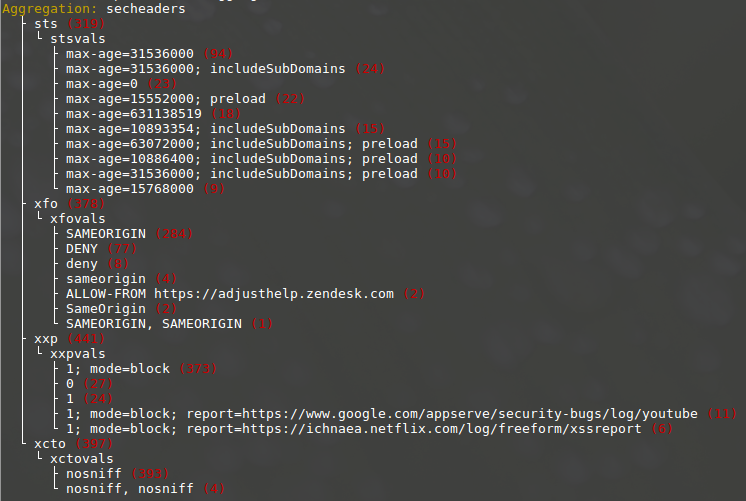 This blog post describes briefly the crawling of URLs with curl and WASEProxy. After some test data is acquired, I describe how nested documents can be searched and aggregated with EQUEL. 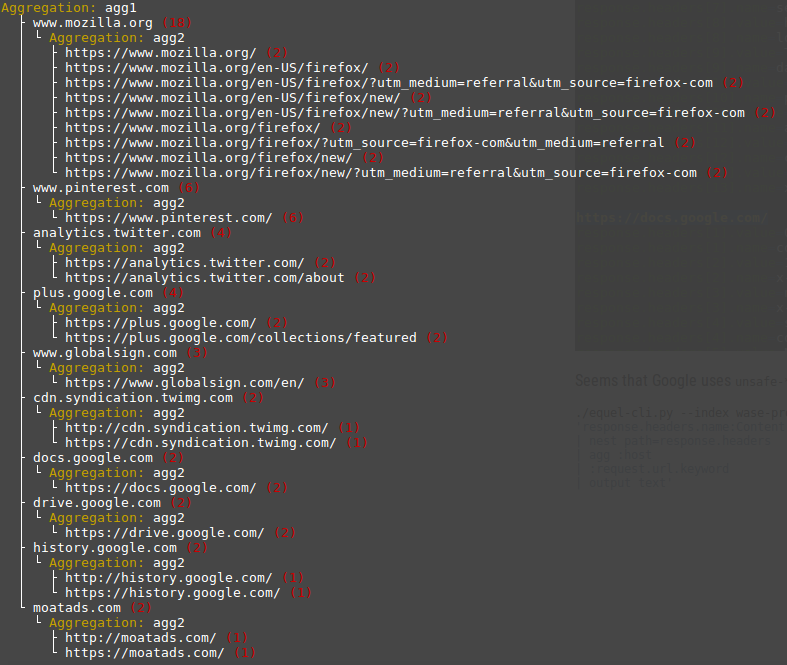 This command line selects the first 1000 domain names and generates HTTP and HTTPS URLs from it. The last line invokes WASEProxy in its default config on Port 8080 that uses an Elasticsearch on localhost and puts new data into the index wase-proxy. This command line parallelizes by invocation of 10 parallel curl instances and stores the progress in a joblog file. This is useful for later resumption of larger scans. GNU Parallel invokes curl instances that use WASEProxy (-x), follows redirection (-L), never checks certificates (-k), doesn't generates output (-o), timeouts after 10 seconds (-m) and is silent (-s). After this has finished, the Elasticsearch instance is filled with the crawl data. Looks complicated? It's easier than it appears! The first line of the EQUEL expression searches all documents. The nested aggregation in the next line causes, that all aggregations below this work on the nested documents given by the path parameter. Remind here that Elasticsearch aggregations are structured in a hierarchical tree. In the next line, the filter aggregation filters the nested response header documents for X-Frame-Options headers. Finally, the terms aggregation from the next line aggregates the values from the filtered documents. From here, the filter and terms aggregation is repeated for each analyzed header. The prefix agg secheaders causes that the aggregation is not located below the previous terms location (the result would be empty, because both filters operate on completely disjunct document sets), but below the initial nested aggregation. All aggregations are named here with the as keyword for better readability of the result. Only the first aggregation must have its name, as it is referred in later aggregation definitions. Appears to be more complicated than the EQUEL expression.